Hi. My name is Beverly and I have a shoe addiction. 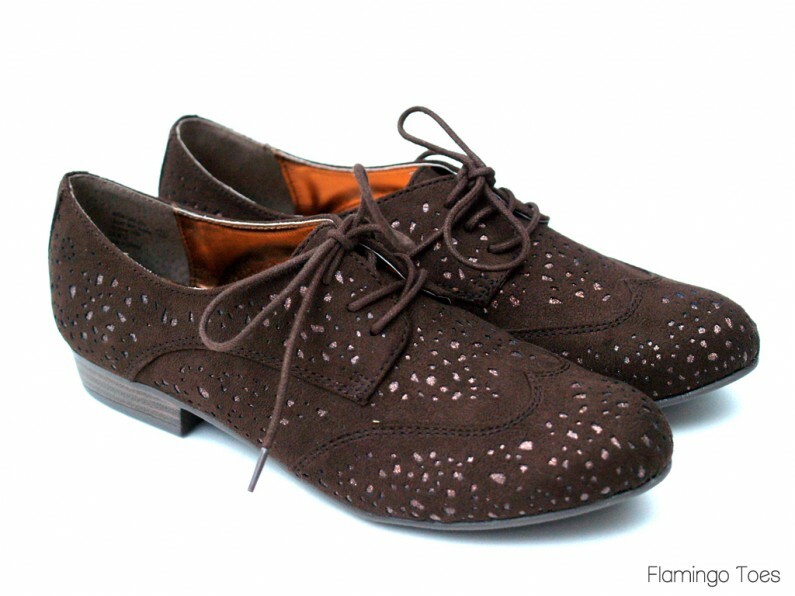 I have a weakness for cute, stylish, funky shoes. Shoes are a little hard to go all DIY knockoff with too. Most of the time. These little cuties are definitely the exception! 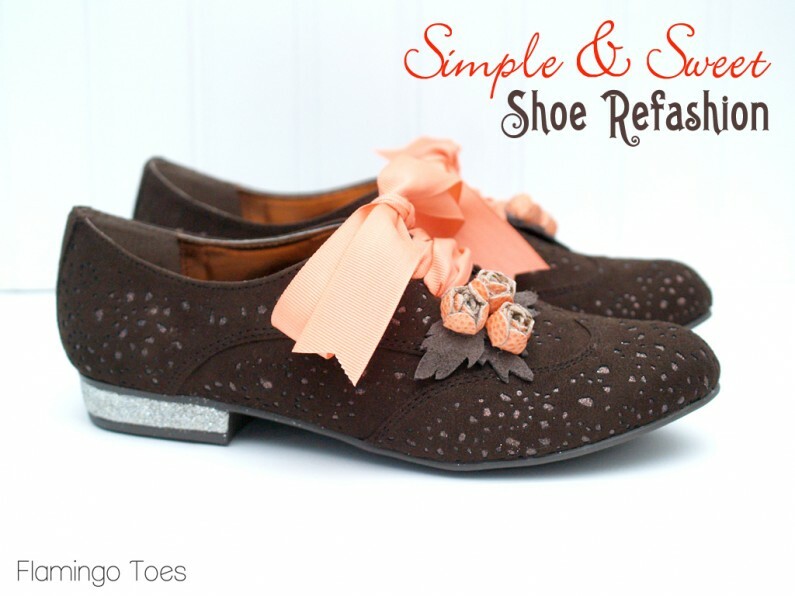 I have for you today my new favorites – my little Simple and Sweet Shoe Refashion! Aren’t they the cutest?? They’re all decorated up with glitter, flowers and bows. I mean – how girly can you get?? I based them on some darling Irregular Choice flats – their Craft Fair Artisan Flat. These cuties run about $145. We can do better than that! Ready to get started on the Tutorial? Here’s how my oxfords started out. I love the little glitter cut outs on these! I thought the blue oxfords in the original were so cute – mostly because I could have told people all day to not step on my blue suede shoes – but I ended up choosing brown because I thought I’d be able to wear them with more. 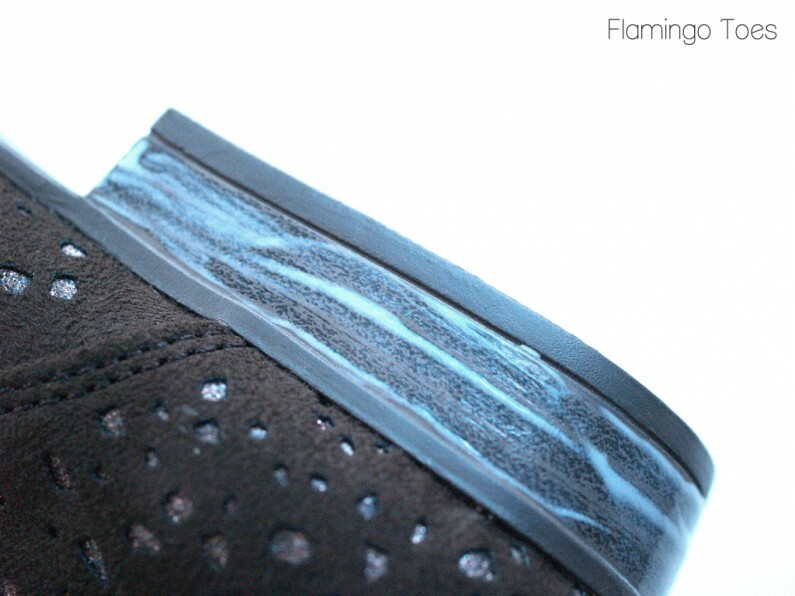 Start off by brushing the heels of your shoes with Mod Podge. Get a good coat on there. 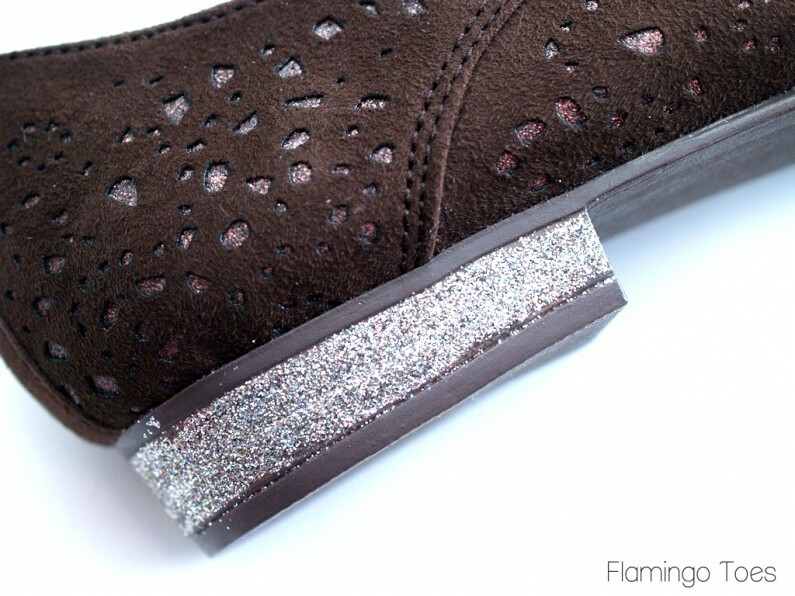 Cover the area with glitter – but try not to get any on the shoes. It will stick to them if yours are suede. This is with one coat. After this layer dries – add another coat of mod podge and another layer of glitter. This will make sure you have the area covered really well. While your heels are drying, trace and cut out the leaves of your flowers. 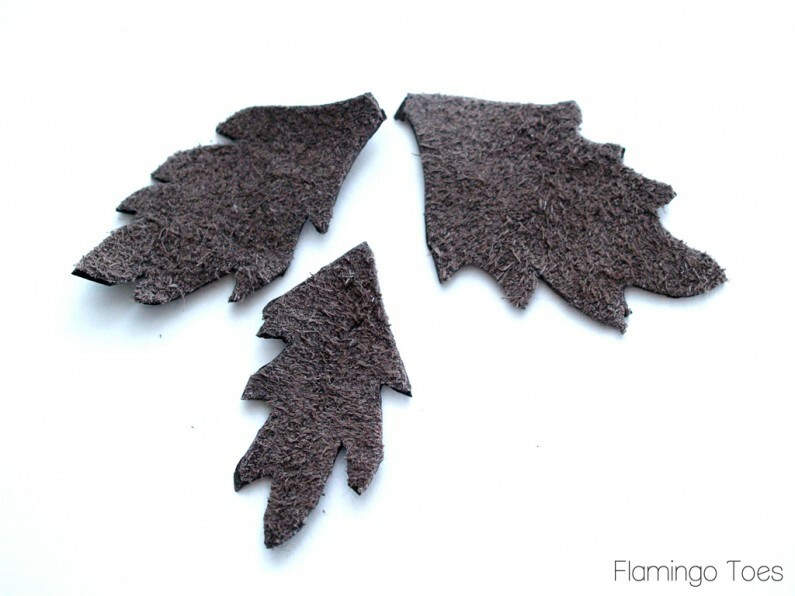 I just drew three leaf shapes on the smooth side of the leather and cut them out. Then I traced these three for the other shoe, so they’d match. They don’t have to be perfect – just have a general, leafy look. Now we’re going to work on the leather roses. These are so fun to do! 2. Clip in towards the center of each petal, just about 1/4″. Turn one of the small petals upside down. Glue a small bead (about 7mm) in the center. Add glue to one of the petals and fold the petal around the bead. 3. Add glue to the next petal. Fold this petal around the bead as well, overlapping the last petal just a bit. 4. Continue gluing and folding petals until the entire flower is glued towards the center. and you have a tiny rosebud. 5. Glue the small rosebud on the wrong side of the second small flower. Glue the petals up around the rosebud, just like you did with steps 2-4. Your rosebud will now be just a bit bigger. 6. Place the rosebud on the wrong side of your large 5 point flower. Glue the petals up around the rosebud just like the other steps. Now you have a pretty little leather rose! Repeat until you have 6 of these little roses. 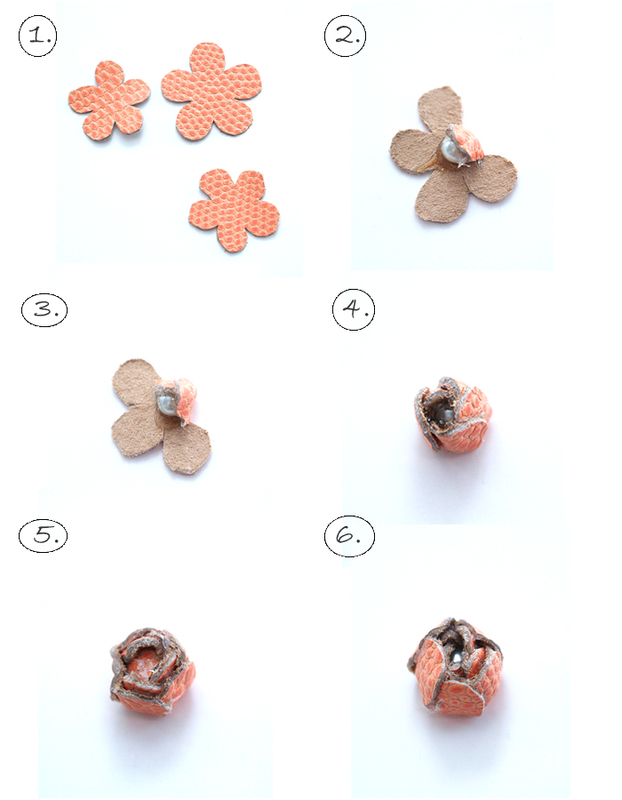 I think you can use this same method and add another set of petals – this will make an even larger flower. It would be pretty out of felt too! 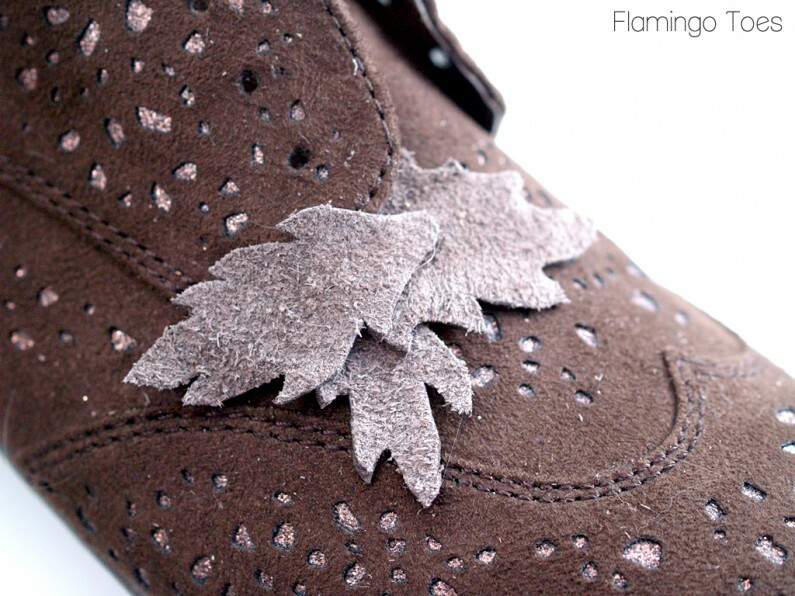 Once you have your leaves and flowers all set – glue the leaves onto the shoe – towards the outside front section above where the laces go. I used a combination of E-6000 and hot glue. I think the E-6000 will hold over the long haul, and the hot glue made it so I could do each step faster, cause I’m impatient like that. 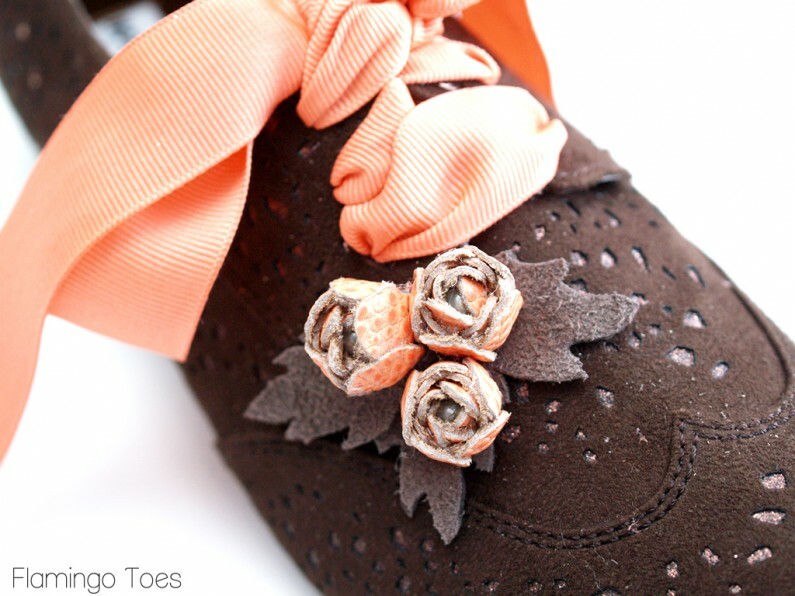 Glue three roses on top of the leaves on each shoe. Same deal with the glues. Cut a long length of ribbon and thread it through the holes for lacing. Trim the ends and seal with a lighter so they don’t fray. 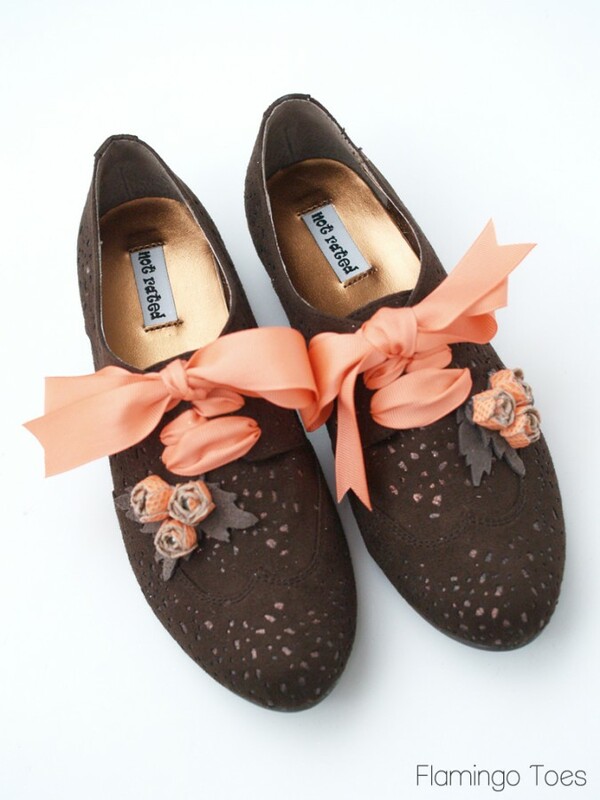 Tie the ribbon up in bows and admire your super cute new shoes. What do you think? Would you give them a try? Linking up at Sunday Scoop, Today’s Creative Blog, Met Monday, Tutorials & Tips Tuesday, Shabby Creek Cottage, My Repurposed Life, 504 Main, and the other fabulous parties on the party page – make sure you check them out! These are SO super cute, Bev! LOVE your technique for those little leather roses! What a great idea! Looks really nice with the jeans :-) I am pinning this! You are just too creative for you own good, and I’m going to insist you hand some of your creativity to me. :) I love this! I love this shoe refashion. Its totally cool. Yes, I would do it, and probably will soon. This is the best shoe refashion I have seen. These are cute, but I have to say. The first thing that popped in my head when I saw them was Mary Poppins! So unbelievably adorable!!! These are great Bev!!! They turned out so cute! I follow you via GFC. I host a weekly party that starts at 6:00pm every Tuesday called Fluster’s Creative Muster Party. I would love for you to stop by and share your talent and creativity. Bev, So cute! 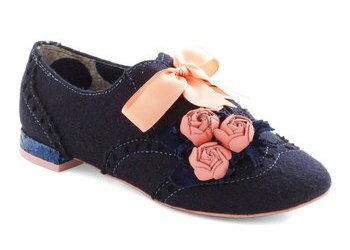 And so much cuter than your inspiration shoes! These are adorable! (I found you through Train to Crazy.) Thanks for sharing your talent and ideas! Puts blue suede shoes to shame! A*D*O*R*A*B*L*E! Love the shoes. Just like you I love cute shoes but a very small budget. 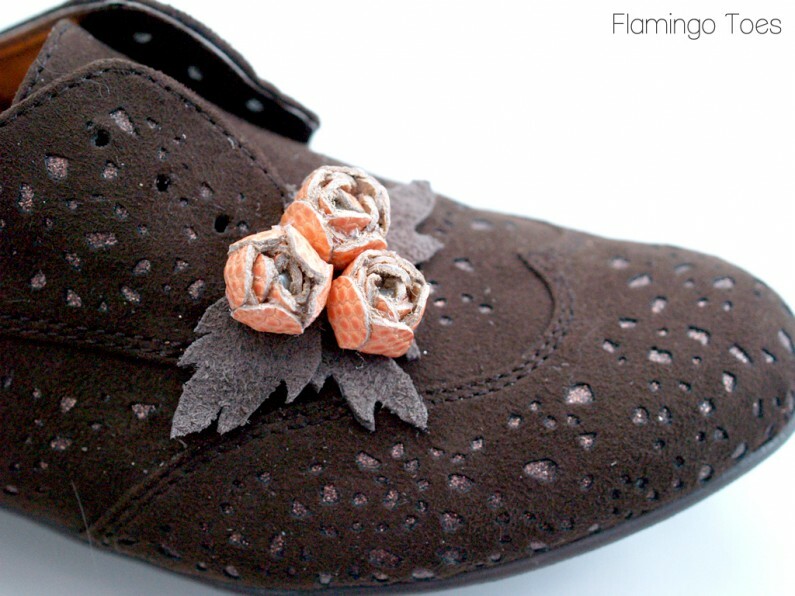 You have given me a great way to spruce up some old comfortable and very worn out shoes and make them cute again. Thanks so much. Love your site. Great ideas and info. 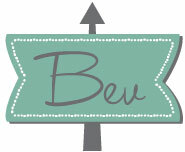 Bev -I just wanted to let you know that I featured your amazing project on my new blog DETAILS. On DETAILS I feature projects that have those little details that make them extraordinary. I’d love for you to stop by and follow along on my new journey. OMGoodness! I absolutely ADORE thee shoes!! How in the world did you come up with this idea? I will definitely be making a pair (or 2…or 3) for myself and possibly anyone else I know who loves them. Thank you girl….you rock!